Like the tap, most experienced beginners pick up the step unconsciously, at least in its defensive function. But it is easy to overlook a step play as an attacking or fighting play. What does the step play accomplish? First, the step play typically adds two liberties to the friendly stone. Before the step, has a liberty at a. Afterwards it has three liberties at the b points. 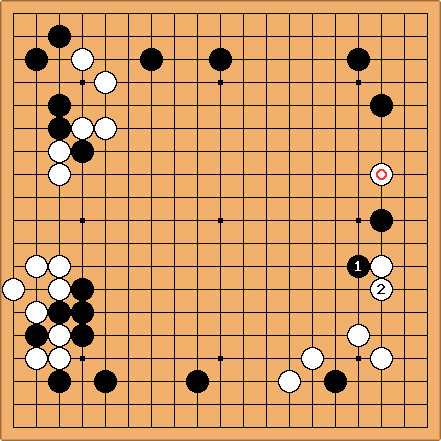 The step play adds two liberties to it unless one (or both) of the b points is already a liberty through the stones connected to it. 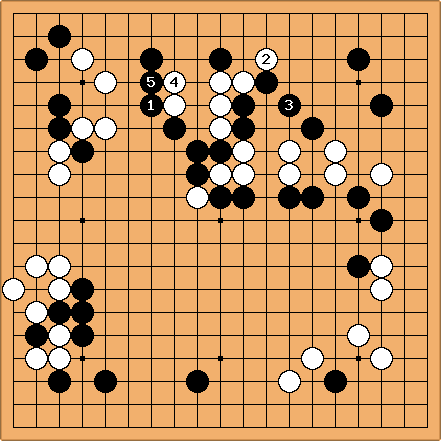 If is not yet alive, the step play typically strengthens it. It may even give it life. And if the opponent does capture it, he will normally have to go to more trouble to capture the combination of two stones than the single stone. Second, the step exerts influence on the adjacent empty points, as a rule. What influence it exerts, and how much, depends upon the surroundings. Here I shall talk about the typical case. Because it has the help of the stone, exerts the greatest influence upon the a points. It is often made when White has some strength on one side or the other, and so it exerts greater influence on the other side. typically exerts less influence upon b. However, is a forward moving play, and its momentum in the direction of b is very important, as a rule. Because it strengthens the stone, the step pattern is perhaps primarily defensive. However, while the best defense may be a strong offense, the opposite is also true. The best offense may be a strong defense. Strengthening may weaken White on one or both sides and prepare for an attack or be part of one. It may even deliver the coup de grace. In addition, the step play prevents a touch play on the same point. That generally reduces the flexibility of White in the local area. When attacking your opponent's stones in your sphere of influence, reducing their flexibility may make it more difficult for them to come out all right by reducing their options. It is easy to overlook the attacking potential of the step pattern. A frequent mistake is to overextend in an attack, leaving weaknesses behind. As a combination of attack and defense, the step pattern can be very useful in a battle. is called a stretch. It strengthens Black's two stones while looking to both sides. 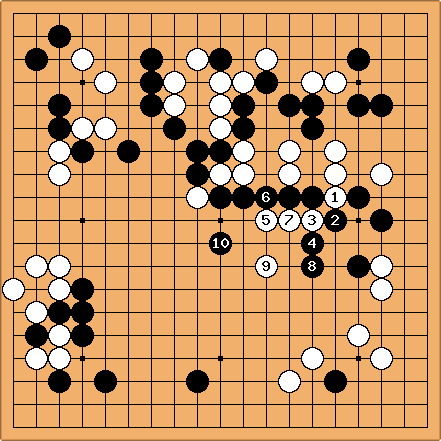 After , attacks White's two stones. is called a descent. It effectively secures Black's right side without offering options to White, and at the same time aims at a large endgame play in the bottom right. retreats with a hiki. Making such a defensive play may be unappetizing, but more aggressive replies will strengthen Black and weaken White's invading stone ( ). is called a narabi. White does not just solidly connect, but peeps at Black's weakness at a. is also a narabi. It protects against White's de at a in an efficient manner and maintains the pressure on White. (If Wa - Bb, Wc - Bd is a ladder. keeps ahead of White with a stretch. is also a stretch. is a strong cut. is a stretch. More enterprising play is ineffective and leaves weaknesses behind. The fighting has become quite complex. is a stretch, but it also serves as a peep at the point. In looking for examples of the step pattern, I came across this play surprisingly often. It combines attack and defense nicely. is a stretch which threatens to cut off Black's central stones. is a narabi that protects them, as well as Black's corner. is a narabi that combines attack and defense. 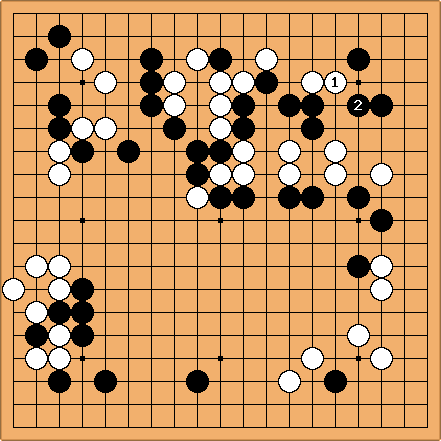 Black bolsters his group while attacking White's central stones. The fighting continues.